Scroll down to find out more about Charmouth`s Past. 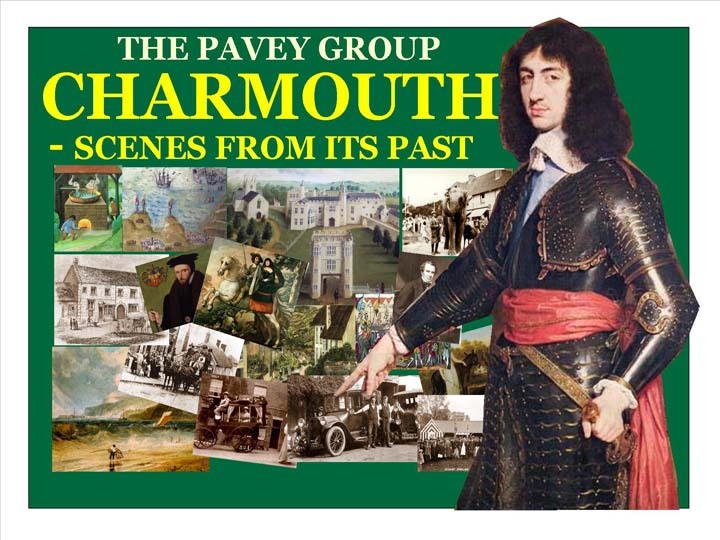 The article will cover key aspects of Charmouth`s History, many of which will give a greater understanding of how the village has evolved over the centuries.There are a large number of relevant illustrations to assist in telling the villages story. It begins with the Romans, who constructed a road passing though this part of Dorset linking Salisbury, via Dorchester with Exeter. This was known as the Ackling Dyke. Another road in the area was the Fosse Way that ran from Lincoln to Exeter and a port near present day Seaton. Both routes crossed near Axminster and were controlled by a Roman fort at Woodbury Farm, on the southern edge of the town. There are still discoveries to be made by the archaeologists to substantiate this completely, but the recent excavation of a section of it nearby at Hogchester Farm adds to this knowledge. Further evidence of Roman settlement was found at Holcombe in Uplyme where a Romano British farm was revealed. The present day Street may well be a length of this ancient road which originally descended from Stonebarrow. Little is known about the vllage after the Romans left, but the settlement would have been small as by the time of The Domesday Book in 1086 only 3 villagers and 16 salt workers are shown living there. The original site for the village centre would no doubt have been nearer the coast as there is a later mention of the Church having to be rebiuilt further inl;and due to the violence of the waves. The slide shows the actual mention of Cernemude as it was written in the Domesday Book. Salt production was common along the coast from Roman times and there is a document as early as 774 A.D. regarding a Salt House in Lyme Regis owned by Sherborne Abbey. It involved boiling the sea water and the remaining salt was then scraped off the sides of the lead pans.the main use of the salt was to presrve food in the winter months.It was to continue along the Dorset Coast for at least another thousand years. This is an early illustration of the process, which used considerable amounts of timber. Robert of Mortiane in Normandy, the half brother of William the Conquorer, owned the village at the time of the Norman invasion.He is shown on the Bayeaux tapestry to the right of William. It was one of 71 Manors that he was given, which included Catherstone and Wootton Fitzpaine. After his death in 1091,another french nobleman, William de Estre is shown as Lord of the Manor. The growth of Charmouth was linked to the foundation of Forde Abbey, near Chard by the Cistercians in 1141. Over time it acquired or was given many estates both locally and as far away as Cornwall, and was to own over 30,000 acres of land. The Manor of Charmouth was granted to Forde Abbey by Richard del Estre in about 1170 and confirmed by King Richard I in 1189. The Abbots of the Cistercian Abbey were to be Lords of the Manor for almost four centuries. The monks were to transform the Village. They recognised its importance as a crossing point of the River Char which would have been much wider then. Here they were to build a Bridge and Mill. A weekly market and annual fair was established in 1278, probably at the crossroads of the Roman Road and the route that linked the coast with Wootton and the hinterland, which is marked by Barrs Lane and Lower Sea Lane today. It would seem that there may well have been an earlier site for the village nearer the coast as in 1281 there is reference to the church being battered by the sea and in a ruinous state and being moved to a safer spot, where it still stands in the centre of the village. The monk's established a Grange here which would have been worked by lay brothers. There was a Market Cross and a Guildhall. All this information and much more can be gleaned from a book still in existence and held at Forde Abbey known as "The Cartulary", which has over 60 entries for the village detailing land transactions. The most important of these is in 1297 when William who was the Abbot at that time decides to create a Borough here as existed at Bridport. "Grant by brother William, abbot of Forde, desiring to improve the manor of Charmouth (Cernemue), that the vill of Charmouth shall be a free borough within the following bounds: on the east side of the vill all that place called Sevenaker by the water below the road from Charrereystone up to the road between Charmouth and Bridport, then along the watercourse which runs to the monks' mill; from there along the course of the river to the sea and to the chapel of the vill; thence along the road ascending to le pillory and then to the cross which stands on the road to Lyme above Radehorne; on the west side of the vill as far as le Sheote by the corner along the ditch to the bank adjoining Sevenaker on the north side. Grant to those wishing to build within these bounds plots measuring 4 perches by 20 perches, by the view of the monks' bailiff, rendering 6d a year for each burgage in equal portions at Michaelmas and Easter". Though it is over 700 years old, this document reveals to us that there was a Pillory and Market Cross at the top of the village. A Mill, no doubt by the stone Bridge, which was worked until modern times. The Shoot, or spring, was at the junction of Higher Sea lane and gave its name to the Fountain Inn that stood near it from the times of the Abbey and is known as Charmouth House today. The houses with their long gardens known as Burgages were all approximately 1/2 acre and their boundary wall to the north of the street still exists with many of the original boundary walls.The boundary to the properties to the south of the Street were marked by a ditch, which can still be seen in places. Some of the original plots can be still located, though a number were amalgamated into larger more viable holdings by the tenants as the Borough was not a great success due to competiton from Lyme Regis and Bridport. A small section of the stone wall dating back to the 14th century which stretches along the boundary of the properties to the north of the Street. A map from 1881 showing clearly the boundary wall and long burgage plots on both sides of the Street. A number of the strip fields forming the Common land between the Street and Sea can also be clearly seen. An aerial view today showing the boundary wall still in evidence especially to the north of The Street. The fields between the Street and the Sea were known as Common land and the mediaeval strip farming would have operated there. This photograph from 1890 shows these fields clearly marked out before they were built on in the following century. The fields known as Hammonds Mead, Five Acres, Single and Double Common denote areas of the village today. This photograph from 1890 gives us an idea how the Mill would have looked. The buildings still exist , but considerably altered and the bridge rebuilt in 1826. The village in the middle ages would have been basically a farming community, though Salt panning was to continue and the Cartulary in 1172 mentions a Grant concerning a tenement for making salt and keeping a boat.
" In Melcombe, in the county of Dorset, a little before the feast of St. John the Baptist , two ships, one of them from Bristol came alongside. One of the sailors had brought with him from Gascony the seeds of the terrible pestilence and through him the men of that town of Melcombe were the first in England to be infected." Soon people in the villages and hamlets near Weymouth were ill. When villagers left the area, to seek refuge in other parts of the country, they spread the infection. No doubt Charmouth, as elsewhere was to lose almost half its population from the Black Death. Forde Abbey grew and prospered over the centuries from its many estates. Though its income from Charmouth accounted for less than 14% of the total. But all this was to change as King Henry VIII and his Chief Minster, Thomas Cromwell decided to close all the religious houses. The Abbott of Forde at the time was Thomas Chard who had held that position from 1521. He decided to spend their wealth on improvements to their buildings both at Forde and at Charmouth, rather than hand it over to the crown. His family name was Tybbes and his brother Raffe lived in Charmouth and appears on the Lay Subsidy Roll for 1525. We are fortunate that through the Abbots House on the Street we have a direct link with the Abbot Thomas Chard. For the former entrance doorway, shown in the slide has an intricate carving in the stonework which displays his initials T.C. on the left hand side above the door. If you visit Forde Abbey today you will see these same letters carved many times over the front. The most spectacular is the Porch with a tablet recording the Abbot building it. The Porch and Great Hall with it's detailed carvings carried out under the auspices of Thomas Chard. Another link with Forde is the statue of an Abbot in the Church,which was originally on the outside of the old church, alongside is a similar model of how it may have once looked. Thomas Chard not only refaced and altered the Abbott's House in Charmouth, but rebuilt the Manor House, whose listing is dated to the 1500`s. Hutchins, in his History of Dorset records that the church was also i mproved at this time. A model of this building has survived and can be seen in the Pavey Rooms. It was constructed by a local carpenter just before it was demolished and the present church built in 1836. The roof can be taken off and the interior can be seen with all its pews and painted gallery. But in 1539, the days of the Abbey came to an end and Thomas Chard was to receive a good pension and took on the position of Vicar of Thorncombe. The Reformation that followed released a considerable number of buildings and estates on to the market and initiated the growth of a many noble families. Richard Pollard bought Forde Abbey for just £400 and Queen Elizabeth sold the Manor of Charmouth for just £25.5.1d. to Robert and William Caldwell in 1564. There is a copy of the original Charter dated 1564 in the Dorset Record Office from Queen Elizabeth I where she grants the Lordship of Charmouth to the Caldwells. But their ownership was very brief, as before the year was out they had sold it on to Sir William Petre. The original Charter was included in the deeds to the Manor and in 1853 it was copied out by Matthew Liddon to prove his ownership of the foreshore. It is very long and seems to apply to all the lands and buildings in the village. In the same year as the Abbots of Forde lost ownership of Charmouth a map was commissioned to show the defences along the Southern coast. Though simplistic it does give an idea of how the village looked with a group of buildings surrounding the Church. To the right of the beacons is Lyme Regis with its Cobb clearly shown at the top. The Church is not dissimilar to the model of the earlier building. Two years later Leland tours England and describes Charmouth as a "Good Fisher Town", it has an estimated population of 200 at the time. Sir William Petre who was to buy the village from the Caldwells, was immensely wealthy and used his position as Secretary of State for King's Henry VIII, Edward, Queen's Mary and Elizabeth to increase it, with the dissolution of the monastic estates. He was known to have 36,000 acres in Devon alone. The house he had built, Ingatestone in Essex is still home for his descendants, and towns such as Axminster were to remain in the ownership of the Petres until the 19th century.He died in 1572 and briefly his son Sir John Petre was to own Charmouth. A comprehensive survey was instigated by Sir William soon after he bought it in 1564 and can be seen amongst the rental books for the family now kept in the Devon Record Office in Exeter. It details all the tenants and their lands and buildings at that time and provides an insight into the village during the transition from the Abbey. Sir John Petre set about selling the village just 3 years after inheriting it. When studying the deeds of some of the older houses in the village there often appears records of the 2000 year leases that he gave for small rents. Amongst these are Charmouth House, Charmouth Lodge, Foxley Farm and the Rose and Crown. The original document dating from 1575 for the Elms, which now houses our parish council, can still be seen in the Dorset Record Office.It shows a Richard Piers of Lyme puchasing Manns tenement, as it was known with an acre of land from him.. Edward Lymbry also buys a number of properties from him, which are later assesed at £48 a year. They include the Fountain Inn, now Charmouth House.The balance of the properties and lands were bought by William Pole of Shute, near Axminster in the same year. The family tree for the Petres shows that Sir William's daughter, Dorothy married Nicholas Wadham of Branscombe in Devon, whose portraits are shown in the slide. With their combined wealth they were able to build and endow Wadham College in Oxford which still has statues of them above it's Gateway. Another branch of the Wadhams were also to become Lords of the Manor of Catherstone, which adjoins Charmouth. In 1590 they added to their estate by purchasing Newlands in Charmouth from Sir William Pole of Shute.
" Chidioke and Charmouthe are two beaches to lande boates, but it must be very fFayre wether, and the wind northerly. Lym. A cobbe or peere, wherein shyppes may aryve, having fayre wynd and bringing the tyde with them, and no danger." To pay for the ships, Charmouth was assessed with many other coastal towns in that year.The list has survived and includes Edward and William Limbry paying 10 shillings and Anthony Tutchen 8 shillings and 4 pence. Amongst the many Estates that Sir William Petre owned was that of Shute,shown in the slide, just outside Axminster in Devon and about 7 miles from Charmouth. He was to only possess it briefly and in 1560 sold it to William Pole for £300. This gentleman was an eminent Lawyer and had been Justice of the Peace for Devon. He went on to also purchase the Colcombe Castle near Colyton and in 1575 the Manor of Charmouth from Sir William Petre. He possessed many estates in the neighbourhood and when he died in 1587, aged 73, his eldest son, William,then only 26 years of age was to inherit them. This is the impressive monument to his father and mother,whose effigies appear back to back at the Church in Colyton which was erected by Sir William Pole. Charmouth was to be governed by Sir William Pole for the next 50 years until his death in 1635 aged 74 . He is famous today as a distinguished historian who produced one of the earliest histories of Devon, although it was printed long after his death. During the Civil War, Charmouth suffered a period of decline. This is clearly shown in 1641, when the hundred of Whitchurch and the tithings of Hawkchurch and Dalwood are ordered to contribute £10 per year to the Poor Rates of Charmouth -"where there are many poor people whom the parish cannot relieve". The Siege of Lyme Regis in 1644, when the Parliamentarians withstood an eight-week siege by forces under Prince Maurice, must have had a detrimental affect on the royalist stronghold of Charmouth. Shute Barton Manor is today owned by the National Trust who let it and occasionally open it to the public. In the 18th century the Pole family built another House which still stands nearby. Newlands is an area on the east of the village known for its large carvan site . But in former times it was separate to the village and had its own Manor House, which originally formed part of Stonebarrow Manor. The earliest mention of Newlands is in the Cartulary that can still be seen at Forde Abbey. The Antiquarian, Sir William Pole, who owned much of Charmouth sold it to William Wadham of Catherston in 1590. After many centuries of absentee landlords the village was at last to have a true Lord of the Manor in the shape of William Ellesdon. He was to purchase Charmouth from Sir John Pole in 1649 during the English Civil War. Both men were Royalists and must have known each other well. His family had represented Lyme Regis both as Mayors and Members of Parliament since the early 16th century. Lyme Regis with its support of the parliamentarians, may well be the reason the family moved to Charmouth.Their support of the King can be clearly seen with an incident in 1651 which was to go down in the village history for ever more. Charles stayed overnight at his brothers house in Monkton Wylde, which still stands today and is still known as "Elsdons"before going on to Charmouth where a boat would be waiting to take him to France and safety. Unfortunately the scheme backfired when the boat man`s angry wife found out, locked her husband, Stephen Limbry in their house so he could not assist in the escape.The future king was to spend only one night at what is now the Abbots House on the Street, shown in the slide,before travelling on to Bridport, and eventual freedom. This shows the room in the house where the King is supposed to have stayed.The diamond shaped plaque on the wall, was originally above a fireplace and commemorated the restoration of Charles II in 1660. In reward for Captain William Ellesdon`s services and loyalty, his Majesty, on his restoration visited the village and granted to him and two successive heirs a pension of £300 per annum, and presented him with a medal bearing the inscription "Faithful to the Horns of the Altar". The King also gives a beautiful miniature by Samuel Cooper of Ellesden, together with a pair of silver candlesticks. It is interesting to read that Bartholomew Wesley, the great grandfather of John, the founder of Methodism was a minister in the village at the time, until he was ejected in 1662. In 1675 John Ogilby produced a series of maps of England including two of Dorset. Enlarged it shows the village with its main Street lined with houses and the paths to the sea, now Lower Sea Lane and Barr’s Lane which led to Wootton Fitzpaine. The Bridge crossing the River Char is noted as is Shasterson not Catherston. The Duke of Monmouth was the illegitimate eldest son of Charles II and his mistress Lucy Walters. He unsuccessfully attempted to depose his uncle, King James II, in what is commonly called the Monmouth Rebellion. After declaring himself the legitimate king and gaining support from the Protestants opposed to James's Roman Catholic rule, Monmouth set sail from Holland and landed in Dorset in May 1685, gathering his supporters at Lyme Regis. Near the shore they encountered a boat with 3 fishermen, who were detained aboard the Dukes ship. It was Samuel Robbins from Charmouth who would go down in history by selling his catch to the rebels. The records show him later 'taken at Lyme Regis and sent to Dorchester gaol' where he was tried and hanged at Wareham, even though he was not a supporter. Another Charmouth man- William Guppy also met an unfortunate end. He was tried at Dorchester by the notorious Judge Jeffries and transported from Weymouth on the way to Barbados, but tragically died on board the Betty on December 17th 1685. There is another connection when Monmouth's party of four hundred foot and forty horse left Lyme Regis on the Saturday for an attack on Bridport.The following day they were routed, and in the afternoon came back helter skelter to Lyme. They are believed to have taken the then existing coastal path through Charmouth,which is shown in this painting by William Daniell on the right. The Manor House today opposite the Church has had considerable alteration over the years but would have been the home of William Ellesden who had at least 4 children. The Hearth Tax for 1661 shows his ownership with 6 chimneys and the next largest would have been the Fountain,now Charmouth House then owned by William Limbry with 4 chimneys. Anthony , the eldest son of William inherited the manor of Charmouth and was to live for 83 years in the village.He was to outlive his children and his fortune was to go to his sister, Mary's family - the Henvills, who had originated in Lower Looke, near Abbotsbury. In the year ,1669 they had bought Catherston for £13,000 and would have been neighbours of the Ellesdons. Mary's husband Richard Henvill was recorded as High Sheriff of Dorset in 1723 and must have lived in the impressive Manor House at Catherston, of which only the porch survives today alongside the present building to remind us of its former glory. We are fortunate today to have two Impressive memorials to Anthony Ellesdon in the Church which both record what a splendid man he was in spending some of his considerable fortune on remodelling the church in 1732. There was also a fine Silver plate with his coat of Arms on it at one time, but was latee sold. On the right of this slide is the magnificent marble memorial erected to Anthony Ellesdon by his nephew. When he died in 1737 he gave a substantial proportion of his wealth to his two nephews, Richard Ellesdon Henvill and Charles Henvill. It seems Charles was to stay in Charmouth and married Elizabeth Hodder and both were later buried here. He would have lived at the manor house whilst his brother Richard was a merchant living in Bristol,who was very active in the Tobacco and Slave Trade. Robert Burridge who bought the Fountain, now known as Charmouth House, was also involved in this trade and his account books for the many trips he undertook are to be seen in the Dorset Record Office today. Richard is only Lord of the Manor for seven years and it is his 17-year-old daughter, Benedicta, who is to inherit the village. Later in 1760 she is left Catherston on the death of her uncle Charles Henville.She marries the Rev. Joseph Durston at the age of 36 , but they are to have no children and she is widowed by 1770. She is no doubt living in the village either at Charmouth or Catherstone Manor as her signature appears on many documents of the time. One of these is the record of a Court Leet held in the village in 1770 which has survived and is shown in the slide. It describes that in consideration of a good road being made in the lane leading to the sea at the cost and expense of the Parishioners, she renounced all the rights and titles to the lane. Her Will shows her leaving her Manor of Charmouth to her distant cousin Richard Henvill. The Manor of Catherston was left to his brother, Robert who was a Barrister on the Island of St. Kitts. The Manor of Charmouth finally ends up being owned by a Merchant living with his family on the Island of St. Kitts in the West Indies. But it is only for four years as he is to die in 1788 and the Manor is put up for sale by Auction and divided up. The Ellesdons and their descendants had owned most of the Village for over 130 years and Ellesdon Road is a reminder today of this important family. Whereas the 17th century had been a time of poverty for the villagers, based on its land and absentee landlords. The 18th century marked a time of change and increasing prosperity. We are fortunate that a Poor Rate list from 1754 has survived. It shows although Richard Henvill, as Lord of the Manor was by far the largest landowner, but other gentlemen are listed paying substantall rates.We can pick out: Thomas Rose for Lily Farm, Reverend Combe for Church Lands, John Goring for The Fountain Inn, Benjamin Bradford for Lushes (Foxley Farm), Jacob Burrow for his own and Langmore Farm. It is interesting to see that Sir John Pole of Shute, still owned a farm here. "Our townsmen beheld by only going to Charmouth, the wonder of the day, better known as "The Exeter Flying Stage Coach" which reached Dorchester from London in two days and reached Exeter in three days. The lofty Stonebarrow Hill had to be ascended from Morcombelake and the descent - a perilous one - to be made by the main road, better called narrow lane, beyond the eastern brook by Charmouth, since abandoned for one further inland, and recently for one still further inland, by which the hill from Morcombelake is altogether avoided." Charmouth was fortunate to have 2 turnpike trusts set up in 1753 and 1757 which created new roads through to Bridport and Exeter. The original Toll House, now known as "Claremont” still stands at the top of the street though later refronted. This old photograph shows the building with its bow window on the left allowing the occupant to see the coaches as they passed through.There would have been a Toll Gate stretching across the Street, which would allow travellers to pay their Toll and continue with their journey. In 1939 the wooden stumps of the old Toll Bar and Gate were found by workmen laying drains outside Granville House. Charmouth had a number of small farms whose names still live on in Wood Farm, Langmore, Lily Farm.This slide shows the cow sheds that once could be seen at the rear of Badgers when it was part of Foxley Farm which existed from Higher Sea Lane to Old Lyme Road. But the largest was the Manor Farm with fields stretching both sides of the Street. At the end of the century it was sold and divided up with the fields to the north known as Backlands which was bought by the village Rector, Brian Coombes and those to the south called Sea lands by Lieutenant James Warden. The Land Tax Rates for 1788 and 1789 reveal how the Manor Lands were bought by James Warden and Reverend Brian Coombes from Francis Henvill. The tax being paid is almost split inro two.Samuel Coade was to buy Newlands and on his death it was inherited by his niece, Eleanor who also was to own his house - "Belmont" in Lyme Regis which she embelished with her famous manufactured Coadestone. Another example of her work can still be seen today at Weymouth in the memorial to King George III which stands there. The people of the village of Charmouth had prepared a lofty triumphal Arch of oak bought, with a crown of Laurel and wreaths of flowers." . Many of the fields would have grown Flax and Hemp which was used to manufacture rope in Bridport. But in the centre of the village in the area bounded by Barrs Lane and the passage to the east of the Manor known as Yandover, there existed a Sail Making Workshop operated by the Kitt family for most of the century. It is James Warden who is to become the Village`s new Lord of the Manor in 1788. It is a puzzle how he was able to afford Charmouth and also Langmoor Manor where he resided. It has been conjectured that it was from prize money for the nineteen Sea Battles he fought in. But the Will for his wife shows them owning considerable property at Wapping, near London. He quarrelled with his son, whom he disinherited, and in his will left the Estate to his wife and upon her decease, upon trust, out of the rents and profits they were to pay to his son, William Weeks Wharton, £20 a year during his life. In 1789 James won an action against the Rev. Brian Combe and others for removing sand and seaweed from the beach which he owned. His arguments climaxed with a disagreement with a neighbour, Norman Bond that resulted in a duel at Hunter's Lodge Inn with James being shot through the heart and the neighbour fleeing the country to Barbados. The episode is recorded on the large tabletop tomb to James Warden near the entrance to Charmouth Church. Towards the end of the 18th century the village benefits as did Bridport from the orders for rope and sails needed by the Navy during the Napoleonic Wars and many fields are shown growing the hemp and flax which was the staple.It was at this time that Jacob Ridley Kitt expanded his business, but sadly it comes to an abrupt end in 1815 at the end of the wars and he was to lose his business. The following year Stephen Atkinson from Beaminster bought the site and began the transformation into Charmouth`s commercial centre. He rebuilt the Limes, now Charmouth Lodge and sold the building to William Stephens that would become The Star Inn.Ann Kitt, who was the daughter of Jacob Ridley was to briefly open a general store in what is Little Lodge. Most importantly was Joseph Bradbeers decison to become the Village Postmaster and run his business from the building that is Nisa today. Ann Liddon was to become the Lady of the Manor on the death of her mother in 1798. She had married Matthew Liddon by licence in Axminster on 22 June 1789 in the presence of her father. The 1841 Census and Tithe Map show her living with two of her daughters in Charmouth at Melborne House at the top of the Street. Her eldest son was to die young at just 40 and most of her estate went to the younger son, Matthew. It is of interests that her eldest daughter Ann Warden Liddon was to be one of the earliest emigrants to Australia when she left these shores in 1833 with her nine children. By then she was Lady Spencer and accompanying her husband Captain Sir Richard Spencer, he was taking up his appointment of Government Resident at Albany. Their original house is now looked after by the National Trust of Australia and the prortraits illustrated, dating back to the year they left these shores are on display. In 1806 Colonel Mudge of Ordnance Survey produced the earliest surviving map of Charmouth, though there is a long lost map dating back to 1783 by James Upjohn of Dorchester whose detailed record book was transcribed by the historian, Reginald Pavey. Smuggling was carried out all along our coast, and Charmouth was no exception to this trade. As early as 1765 there is a reference to a resolution in the vestry minutes to pay for the defence of Digory Gordge, parish clerk who was being prosecuted for smuggling. The local newspaper on the 31st January 1825 reports that : On the night of Saturday week, three men of the Lyme Preventive Station were on the look-out near the mouth of the Charmouth River, where they captured 150 kegs and two men. They had not retained possession long before they were attacked by a party of smugglers 70 or 80 in number and as is usual in such adventures they appeared affected by liquor. They advanced with great violence. In defence, the officers were compelled to fire in the midst of them, in consequence of which, one man fell and was carried off by the party”. Again on the 3rd March 1828,the paper reports that Henry Tippen, a married Charmouth Seaman aged 49 with a swarthy complexion was imprisoned for smuggling until he paid the penalty of £100. The Look Out dates back to 1805, being built during the Napoleonic Wars as part of the coastal warning system, but used principally as a base for Excisemen working against smuggling.This photograph shows some of those who were stationed there. In the background is the Battery where the ammunition for their guns was kept. The spot is now the entrance to Thalatta in Higher Sea Lane. "Charmouth, with its high grounds and extensive sweeps of country, and still more its sweet, retired bay, backed by dark cliffs, where fragments of low rock among the sands make it the happiest spot for watching the flow of the tide, for sitting in unwearied contemplation". This watercolour was painted by the talented local artist, Hannah Newberry in the early 19th century below where the Heritage Centre is today. The 19th century development of coastal resorts revived the village and encouraged the building of Villas . The population in 1801 was 369 and increased to 664 by 1871, but actually declined to 560 by 1901.The village is fortunate to have a number of attractive properties such as Hillside and Melbourne House from this time. The censuses reveal that a large number of villagers were employed in service to the wealthy families who had moved there. In Lyme Regis -The beautiful promenade in Lyme is entirely destroyed.The Hotel, and several houses near the Cob, the Bank House and all the houses opposite the Pilot Boat, are in a wretched state: the sea rolled right through them, and carried away everything that came in its way. The Unity, bound for London, was driven out of the harbour. Three men were on board, besides the Captain. They remained a considerable time in a very distressed condition under the cliffs at Charmouth, but as soon as the tide left them, they were rescued from their perilous state, and conveyed to the Coach and Horses public house at Charmouth, where they were immediately provided with a bed. There were further improvements in Charmouths roads in 1825 when the Bridport Trust was set up which created a new road further inland from Stonebarrow and built a new stone bridge. The Toll House and its many milestones are reminders of this stretch of road today. Shortly afterwards another road was dug through the cliffs below the Old Roman Road and became known as Old Lyme Road. The 1841 Tithe map shows all the roads that existed at that time. It can be seen that any development was along the Street and Axminster Road, with the remainder mainly down to farmland. The cutting through the cliffs for gthe new road was referred to as the "Devils Bellows" as it suffered from very strong winds. A guide book of the time describes - "The environs of the town are pleasant, the views in the vicinity extensive and beautiful, and all the approaches good and wide. A tunnel on the road from Charmouth, opened in 1832, pierces one of the steepest hills between London and Exeter, and is about 70 yards long, and of sufficient capacity to permit two large waggons to pass each other". It must have been depressing news when the village was told in 1835 by Charles Wallis of Dorchester, architect, that he had never seen so dilapidated or unsafe a building, and that it was necessary to build a new church. However the whole village worked with enormous energy to raise the money. The numbers of residents who subscribed, was 334 whose subscriptions came to £1221.The number of friends outside the parish was 375 whose donations came to £1130 making a total of £2351. The finished building and Rectory are shown in the print by local artist Galpin. In 1846 the famous engineer, Isambard Kingdom Brunel proposed a Railway to Charmouth and drew up plans whose frontispiece is shown in the slide. It is the first of many schemes that are all later abandoned. Tragedy hit the village in 1852 when 8 children in one family die of Scarlet Fever in the space of one month as is revealed in the Church records for September of that year.The father, Andrew Dunn and his family were living in poverty in terrible conditions in a cottage in Lower Sea lane at the time. In 1853 George Frean from Plymouth became the Lord of the Manor of Charmouth. It was his son who was to go on and found the famous Biscuit manufacturers - Peek Freans. The Peek family lived nearby at Rousden, where they built a large estate, whose buildings can still be seen near Lyme Regis. in October 1853 the local paper reported "That part of Charmouth cliffs adjoining, belonging to M.Liddon, Esq., lying between the Sea Lane and Lyme, has lately been purchased by a company of Plymouth Gentlemen. The cliffs abounds with large quantities of stone, which when burnt, produces an excellent cement of the Roman Kind. We understand that kilns will be immediately built for its calcination". This was eventually to become the Cement factory built by George Frean for his brother in law - Michael Morcome. But it was never successful and has been empty most of its life until recently when it was converted into The Heritage Centre. On the 16th October 1858 The Western daily reports "This pretty little fashionable watering place, which is provided with nearly every trade and profession has just added to its list of professors that of Photographic Artist", in the person of Mr. J. Bottomley, schoolmaster, whose ability and taste have already displayed themselves in the specimens that he has taken". We are fortunate that a number of photographs were taken by him of the village which have survived. Amongst them is this historic image of the Coach which ran from Bridport to Lyme Regis, which is standing outside the former Coach and Horses Inn. This photograph is of Bridport Railway Station shortly after it had opened in 1857. It initiated a number of schemes to link both Charmouth and Lyme Regis to it and Axminster Station. The most important of these schemes was that of the famous engineer, Sir John Hawkshaw who in 1864 briefly owned much of Lyme Regis and Charmouth in his bid to get a railway through. It is astonishing today to see the detailed plans that he drew up. We were even to have a Station to be built in the field behind the shops which is now the village playing field. But it was turned down by Parliament after competion with the Great Western Railway. These are some of the many newspaper references at the time regarding the railway coming to Charmouth and how it would benefit the community. The frontispiece of the project that was placed before Parliament by Hawkshaw. This Map shows the proposed route of the Bridport, Lyme & Axminster Railway Line which included a station at Charmouth in 1864. The hilly West Dorset countryside with its call for tunnels and considerable earthworks must have caused the plan to be shelved after its defeat in Parliament. The Bridport, Lyme Regis & Axminster Railway Company Map showing the Charmouth section and its proposed station with access from Barrs Lane. In 1871 powers were obtained by the Lyme Regis Railway Company to construct a Line from Axminster via Uplyme to Lyme Regis, with an extension at a later date through Charmouth and continuing north of Chideock into Bridport. The first sod of the proposed railway was cut on 29th September 1874 by the Mayor of Lyme Regis but the line failed to materialise. It would seem looking at the above map that the engineers had not taken into account any land slips that regularly account along this section of coast. It was not until 1903 that Lyme Regis finally got its own railway. Whilst trying to get his Railway scheme approved John put his young son,John Clarke Hawkshaw up for election and as can seen from the illustration, he only just lost by 9 votes to his opponent - John Treeby. In the same year he used his engineering expertise to give the village its first mains water supply which ran from the Axminster Road through the village with stop taps at regular locations. One of these can be seen on the left in this delightful painting of the village by the artist, Lucy Rosetti in 1879. This slide shows two of the places on the Street which still have the brick insets in their walls where the stand pipes and taps were available to take the water from. After Hawkshaw`s scheme was turned down by parliament, he placed his property on the market in 1867 and this map shows how much of Charmouth was on offer. Lot 21 was Lily Farm that failed to reach its reserve and remained in his family until 1914. The largest lot no. 31 included most of Higher Sea Lane and the coast also failed to sell and was eventually bought by John James Coulton, a Solicitor from Kings Lynn in 1873. In 1865 John Wellman who had a shop in what is now Rupert House, near Nisa, produced his "Guide to Charmouth and Its Neighbourhood", which provides valuable information about the village at that time. There are a number of adverts that includes John Potter who had a shop opposite Charmouth House. This is an early photograph from about 1860 showing John Potter standing outside his shop. In the distance the former Court building and the old almshouses can be seen which were demolished in 1867. Notice too that the building opposite had iron railings, which were later replaced with a stonewall. The Coastguards cottages were built in 1867 by Richard Hodges and then leased to the Admiralty. On the left is the skittle alley from the pub that formerly stood there and whose license was transferred to a former butchers on the Street which was renamed "The Royal Oak". The foundation stone for the new school in Lower Sea lane was laid on 26 th August 1869 by Mrs Breton, the Rector's wife. All the shops in the village closed for the day to celebrate. On the right cab be seen the newly built Almshouses. In the distance The building with a stone cross on its roof was the workshop of Pryers who were Stone Masons and is today the Pharmacy. To the left of the lane was Sandfords which was later demolished to widen the Lane. In 1855 a wealthy widow, Mrs Mary Napier Stuart ( nee` Shalch) bought Rawin Mallock`s house and completely rebuilt it and renamed it "The Court". In due course she becomes the largest landowner in the village by buying brothers former farm, Backlands in 1870. By the time of her death in 1872, aged 77 she had also bought Stonebarrow Farm, the East Cliff and several fields in the Lower Sea Lane. Amongst her purchases was part of “Fountain Mead” opposite “The Court”, so that she could have a view of the sea from her library. It later became known as Court Field and was the site for many years of the Village Club Fair held every Whit Monday. A house behind the War Memorial bears that name to this day. The picture shows one of these fairs with the distinctive shape of the Court in the background. In 1857 Little Hurst, which is now the Doctors Surgery, was owned by Lord Herbert who opened a convalescent home there which had 20 beds and a resident matron. Cecil Woodham-Smith in her "Life of Florence Nightingale" says that Florence Nightingale attended the opening ceremony. The Bridport News on the 21st February 1867 reports :"One of those excellent institutions on a small scale is about to be established at this place, to be supported by voluntary subscription. A House has been taken, capable of receiving a few patients, in which a nurse will reside. It will be under the Superintendence of Mr. Norris, surgeon (originator of scheme) and a committee. "The photograph shows the building next to the former New Inn at the top of the Street, which became the Village Hospital for a time. Many of Charmouth`s finest buildings were lost in a series of disastrous fires at the end of the 19th century. Fortunately photographs of these record their former glory. One of the earliest was the group which runs from Stanley House to Nisa today, which were destroyed in a fire in 1864 and subsequently rebuilt by Giles Pryer. Early photographs of the village show the common use of thatching in the roofs, which was prone to ignite, and often by the time the fire engines had arrived from Lyme Regis it was to late. This photograph shows The Coach and Horses, formerly known as the 3 Crowns which stood on this site for many centuries. But in 1882 a disastrous fire destroyed it, though it was later rebuilt. This animated photograph shows one of the many coaches that would stop at the Coach and Horses enroute to Lyme Regis or Bridport. In 1888 a fire broke out in Mr Durrant`s Grocery Shop and spread quickly to the adjoining New Inn occupied by Mr H. Wild. The newspaper report at the time mentions that the Lyme Regis fire engine made a start for the fire, but was unable to proceed for want of a horse. This is another very early photograph of the former New Inn and the shop that were destroyed in the fire. This photograph looking down the hill towards Charmouth House, shows the front of the New Inn on the left after it was rebuilt. In 1894 a fire starting in Frank Cole’s Bakery spread to the adjoining properties as far as Barr’s lane. This idyllic scene shows group of buildings on the left which were lost. They faced on to Pryers Stone Masons yard which occupied all of Pear Close. After the fire Frank Cole built what was known as Sunnyside and now Devonsedge as a Bakery, Teashop and Hotel. The ground at the side was bought by Pusey Pryer and was left empty until he died in 1931 and was subsequently developed as shops. The photograph shows Robert Hazard on the left outside his shop which he ran as a general store and Ironmonger. In 1891 he suffered a disastrous fire and was only partially covered by his insurance. He subsequently rebuilt it as can be seen in this slide, but after another fire he gave up and the site next to Peria is still vacant today. The daughter of Vernon Hugh Scalch who lived at The Court was married to Alfred Haggard, brother of Rider Haggard, author of King Solomon's Mine who was a frequent visitor at 'The Court'. When he required names for two of his characters for the novel, “She” that he was writing in 1886, he chose Leo Vincey after Edward Vince the owner of Charmouth Stores (Nisa today) and L. Horace Holly after William Holly, the owner of “Wistaria” who operated the Axminster Bus from there.Haggard's novel is a first-person narrative of a journey into an African kingdom, where a mysterious white queen rules. Famous authors like Henry Miller and J.R.R. Tolkien have cited She as a key influence of their work. She has gone on to sell 83 million copies. This photograph shows William Holly with his popular coach outside Devons Edge, on the Street. When William Holly sold the Axminster bus in 1900 he tok up the position of Postmaster at his house "Wistaria"and his son William Holly Junior later took on the post when he retired. It was to remain in that building for the next 40 years until moving to Devons edge. There was also a branch of Lloyds Bank in the left part of the property. In a former building that stood on the site of today’s post office there was believed to be poltergeist activity. In 1894 Conan Doyle, the author of Sherlock Holmes and two companions - one of them, Mr. Podmore, a diehard opponent of spiritualism—visited the haunted house in Charmouth. An elderly woman, her grown son, and a married daughter were renting the old house. The family was plagued by poltergeist activity, mostly in the form of unexplained noises that was so severe they could barely tolerate living there. They investigated the fearsome noises that occurred, but could find no explanation. About a year after the investigation, the house burned down and an old skeleton of a child of about ten was found buried in the garden. Doyle wondered if this child, cut down too early in its life, was the cause of the haunting. In 1903 Deputy Surgeon General Charles A. Innes. R.A.M.C. came to live at 'Lynwood'. He fought in the Crimean War and Indian Mutiny and looked forward to the centenary of Waterloo in 1915, as he hoped to wear his father's medals with his own at the Waterloo banquet. His father Lieutenant Alexander Innes served at Waterloo. It was a sad day when the centenary banquet was cancelled owing to the war with Germany. He died in 1920 aged 88.His son Sir Charles Alexander Innes moves into Lynwood in 1915. From 1927 until 1932 he was Govenor of Burma. Lynwood is the building on the right, with Grasmere in the Middle and Fountain Cottage on the left in this early photograph. These maps appeared in the auction details of a housing estate that was planned in both 1898 and 1904 in the lower part of Higher Sea Lane. The land was owned by John James Coulton, a Solicitor living in Kings Lynn. He initially offered 55 lots, but only a few sold and he tried again 6 years later to sell the balance, but it is said that no one turned up for the auction and the land was sold off piecemeal afterwards. In 1908 a wealthy Bristol metal magnate, Alfred Pass,was to buy Charmouth Manor with its fields to add to his 5000 acres and properties in the vicinity. He was unable to complete its purchase due to his untimely death. It was to be to his son, Douglas that the title Lord of the Manor of Charmouth was to be given in 1908 when he paid £1,400 for the Cement Mill with the surrounding 63 acres. This is an aerial photograph of The Bristol works based in Bedminster operated by the Pass family. This slide records the tenant Farmers and Household staff presentation of a Silver Bowl on Alfred Douglas Pass becoming the new Lord of the Manor in 1906 when he was just 21. The Long List of tenants included Robert Morgan who was renting Charmouth Stores and Frank Coles the Bakers from him as well as many of the farms in the area. T- Miss Bullen can be seen in the centre of this photgraph opening the new Cricket Pavilion in 1904.There had been cricket played on the field from at least 1863, when Sir John Hawkswell is recorded as presenting a Roller. One area of the village that has changed very little are the Tennis Courts which were started about 1880 by General Eliot and George Pavey, father of Reginald, and are still going strong today. The Whittington sisters -Beryl, Winnie, Dorothy and Joan virtually controlled the club for many years as well as run a small prep school in Little Lodge adjoining the Limes, where they lived. In 1897 Queen Victoria was commemorated by the construction of “The Jubilee Shelter”. It had formerly been the building used to store the ammunition for the Volunteers but was adapted by adding a roof and balcony around it, as can be seen in this photograph of the timber bridge that went over to the island where it stood. Lower Sea Lane was often damaged by the river when it flooded. To prevent this the cliff east of the Jubillee Shelter was cut through in 1904 to straighten it. It was known long after as "Hodders Gap" after the local contractor, who can be seen on the left of this picture. The contact for the work with a map which shows the large Ox bow bend in the river at that time before it foreshortened. The first motor car in Charmouth was a De Dion Bouton which was owned by Sir Cecil Harrison. It is seen here outside the Coach House on the Knapp. At the wheel is Arthur Harrison, with other members of his family. In 1910 the Recluse, George Moly gave his estate to Lyme Council and proceeds from it went to create the Langmore Gardens after the name of the house where he lived in Charmouth. The conveyance, showing the plans of the large estate at Langmore which he gave to Lyme Regis after holding a grudge with Charmouth. Here is a typical scene on Charmouth beach of an overdressed family enjoying themselves in 1910. At the beginning of the 20th century Samuel, the father of Barney Hansford would take superb photographs of Charmouth and the surrounding villages. Amongst these were some that were produced as postcards to commemorate the coronation of King George V in 1911.There follows just a few of the lively procession down The Street which provide a marvellous record of Charmouth at that time. The Bridport News reported in May 1924 that " As a result of the torrential rains, which accompanied the thunderstorms during the week, Dorset main coast road is being seriously endangered between Lyme Regis and Charmouth. A big landslide took place at the highest point, 400 feet. Above the sea level, where it runs through towering cliffs. A thousand tons of cliff are gradually moving towards the sea, and there is now a sheer drop of 150 feet, from the coast bank of the road. Danger flags are being flown, as the road itself may subside at any moment, but despite this a number of motorists are running over it." Although Reginald Pavey recorded the village in his Albums and notebooks for nearly 50 years, photographs of him are very scarce. these are the only that we have so far traced. The first is of him as a scoutmaster soon after moved back to the village in 1926 and the other in 1950 when he opened the Tennis Club changing rooms with the builder W.Mills. He had been born in the village in 1884 and lived for awhile at Charmouth Lodge, then called the Limes. After a time as a teacher at Clifton School he returned and spent the rest of his life here living at the Well Head. The Pavey Group was founded in recognition of the important part he played in recording its past until his death in 1973. This aerial view taken in 1927 shows the large field known as Pear Close, which was owned by Harry Pryer. It was not until his death 4 years later that houses and shops were built on this and the plot of ground at the side of Devon’s edge. The line of tall trees along Lower Sea Lane were also to go shortly afterwards. William John Dampier moved from Dorchester where he worked for the department store of Boons and Sons to Charmouth in 1918 and took over the Stores which his family continued to run until the year 2000.This photograph from 1935 shows William on the right with his staff and son Donald who was to take the store on after his father. G.K Chesterton of Father Brown fame, was a frequent customer at Charmouth Stores. One of the verses he was famous for was "The Wicked Grocer", which reflected badly on the trade. But after the impeccable service he received from the Dampiers in 1929 he penned a new verse which he dedicated to William called the "Good Grocer" that is full of his praises. The signed original copy of this is still treasured by Ron and Jean Dampier. After the First World War, Billie Gear opened his first garage in the stables of the George. He is shown here with his workmen proudly standing by his vehicles. For a short time Billy ran a Garage next to the Coach and Horses, but then he moved his business to a permanent site next to the Queens Armes where it was to trade for many years. Alhough the workshops have been built on since, their former showroom is incorporated today in the Fish and Chips shop. This view of The Street was taken soon after it was developed and the shops and Gears Garage were built there. This astonishing photograph shows an elephant from a visiting circus outside the shops, soon after they were built. Earlier in 1929 the village made the national news when a Lion escaped from a Circus Car when it hit into a tree just outside the village. It roamed the fields for a time and attracted large crowds. It went on to seize one of the cows there and sadly was shot dead by a marksman. In the 20th Century the village was to teble in size with the modern development to the south of the Street.Charmouth trebled in size during th 20 th cenury modern development to the south of the Street. This is a photograph of the Pass Family taken in 1937, and from left to right are Philippa, Mrs Olive Pass, Joan, Colonel Douglas Pass, Honor Matilda and Katherine. Douglas was very benevolent and sold the Parish Council the foreshore, their playing fields, and land for the tennis courts in Lower Sea Lane for nominal amounts. He gave much to Enterprise Neptune, helping to buy the farms that now provide the wonderful walk from Golden Cap to Charmouth along the cliffs. He also gave them Lamberts Castle and much of Fishpond and his wife gave Coney's Castle to the National Trust. Most of the estate was disposed of after his death though there are still links in Wootton with the family today. Charles Hodges left the village £1000 in his will to purchase the playing field when he died in 1932.They were to buy the land from Douglas Pass. The photograph shows the original plans which are in the Dorset Record office. An early photograph of cricket being played on the field. In 1934 Charmouth Parish Council took out a lease with Alfred Douglas Pass on the Old Cement Works and the area around with an option to buy. This they took up 4 years later by paying £2970 for the freehold. Altogether they borrowed £4206 from the Dorset Council and Ministry of Health to complete the sale and make repairs. It was a popular decision and was carried unanimously by the Council at the time. The Parish was very fortunate again in 1945 when Miss Evan`s who lived at Hammonds Mead gave them a nother piece of land along the foreshore shown on the map. This is wonderful Illustration from the book for the village, which was commissioned by the Women’s Institute after the war depicting with a sense of humour events that happened. The exploding cow was a true story when one trod on a land mine near the beach. This photograph gives us an idea today of how the beach must have looked ready for an invasion. The flags are flying at the top of The Street in 1945 when peace was declared. Many shops existed at that time including a Post Office and Grocers. This painting by Claude Muncaster shows the "Charmouth Post Office" on the left which was run by the Longs,as a general store. Immediately up from the shop was Askew House set back from the road, which for a long time was the Charmouth Surgery run by Dr. Chamberlain. The building with the Sold sign was once a Fish shop run by James Gear. As well as a number of businesses there was the "New Inn" a little further up if you felt like a drink, now sadly gone. The dampiers van can be seen here outside their store. This is a view of the inside of their shop with Donald Dampier, father of Ron behind the counter of Charmouth Stores taken in the 1950`s. During the spring of 1954 severe gales so damaged the concrete walls of the Car Park that they had to be entirely rebuilt. Here are some of the workmen outside what was to become the Heritage Centre. This photo shows a gardener cutting the lawn of Charmouth Lodge. In the distance can be seen Pryers Stone Masons ofices, which is now The Pharmacy and to the right is Sandfords which was demolished in 1958 to widen the access to Lower Sea Lane. Any one who buys items linked with Charmouth on Ebay will be aware of how popular items produced in the past by Charmouth Pottery are. The business was started in 1967 by Mike and Susan Hendricks in old Forge that is now the Fossil shop at the top of The Street. In 1968 Barney Hansford opened his colection of fossils and later his Country Life Exhibition. He became a well-known figure and was often interviewed on T.V. illness forced its closure in 1986. This is Charmouth Beach in the summer of 1968 which shows how popular it was. At that time the police would stop people driving down Lower Sea Lane after the car parks were soon filled up in the morning rush. A number of people had to be rescued from their caravans as the River Char burst its banks, sending floodwater cascading through the Dolphins Caravan Park in the 1979 floods in Charmouth. The extent of the floods can be seen from this aerial photograph. In 1990 the Bypass that relieved much of the congestion that Charmouth suffered was finished. 1993 New School opened The present building was started in 27th April 1992 and opened for the children on 23rd April 1993. It was built at a cost of £865,000 on the land previously used as a sports field and was officially opened by Lord Digby, Lord Lieutenant of Dorset on 23rd June 1993.